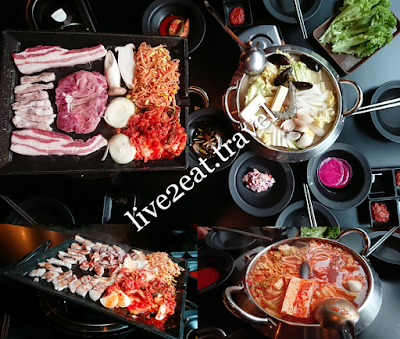 Eight Korean BBQ opened its 1st branch on the 2nd floor of Central in 2013 and has since expanded to Shaw Centre. My dining companions and I visited the former for lunch on a weekday, and was surprised there was just another two tables occupied. According to the website, it is named after its 8 Colours Set – pork belly slices in wine, original, garlic, smoked, herb, curry, miso and gochujang flavours (from the lightest to the heaviest). Decided to order its Flower Pork Set of flower pork belly, pork neck steak and pork jowl to try different parts of the Mangalitza hog used here. A rare pig of Hungarian origin often mistaken for sheep due to its thick woolly coat, it can withstand harsh winter as low as -30oC. Is this why the raw meat was red like beef with marbling twice that of regular pork? Was apprehensive about putting a piece of 100%-fat-looking jowl into my mouth but am glad I did as fats had never taste so good, possibly due to Mangalitza fats melting at a lower temperature than regular pork fats. There was no gamely smell to both the fats and meat which were tender, juicy and sweet. Every set comes with raw leafy greens that you can use to wrap the grilled meat and mushrooms with kimchi and bean sprouts. And Seafood Bean Paste Stew that started a tad bland (though a dining companion thought it was flavourful enough), was just nice in the middle of our meal but too salty and thick at the end. Could neither rave about the clams nor fault the squids in it though the mussels were not fresh which the staff kindly changed for us. We also ordered a comforting White Ginseng Chicken Soup – taste of the chicken that could be easily torn apart with the Korean metal flat chopsticks and spoon, was accentuated with a dash of the salt and pepper that was served alongside. Of the banchan, our favourite was the thin slices of preserved radish. Oh, and did I mention that the grill plate was tilted to drain away the oil and that you can spray fabric freshener on your clothes before leaving the Korean restaurant?